On one such “killer-sub hunt” Nate’s ship encountered a Japanese submarine on the surface recharging its batteries. PC1128 took the sub under fire with its Mk. 21 pedestal mounted 3-inch 50-caliber deck gun, but the submarine dove before a shell struck home. The patrol craft next attacked with its primary ASW weapons, the 600-pound “ashcan” depth bombs. Pools of fuel oil bubbled to the surface, but Nate never knew if PC1128 sunk the sub or if the Japanese were playing possum. On another sub hunt, Nate was injured when, in heavy seas, his leg became trapped and he was in danger of being sucked into the bilge. Nate grasped an overhead bar and pull himself free, but friction burns on his left leg required surgery. On Tulagi, Nate mingled with the local fauna. At night “tarantulas would hit the floor of the hospital, and you could hear their movements … it was a terrible feeling,” he recalls. While hobbling down a jungle path to the Red Cross tent, Nate, armed only with a cane, “[I] ran across a giant lizard. It was going north, and I was going south.” I always had an odd feeling in that particular area,” Bob remembers, “because the Marines had not cleared out all the Japanese … As long as they didn’t take a life, they were permitted to remain there. I suspect that they were looking for food. There was no one that would come to take them off of an island when they lost the battle, they were there to commit suicide or exist,” the battle-hardened veteran concluded somewhat wistfully. In November 1944, just before the operation which triumphantly returned General Douglass MacArthur to the Philippines, Bob finally connected with his brother, also in the Pacific. Roger Nate was a Coast Guard signalman who hailed every Navy ship he encountered looking for his brother. 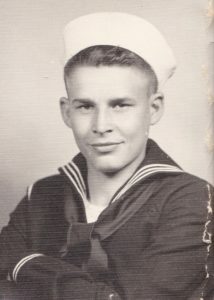 The two finally connected on Thanksgiving 1944 but Bob’s time in the Navy changed him so much that Roger did not recognize him. “When I joined the Navy,” recalls Nate “I was five-foot-six and a half and a hundred and thirty-eight pounds probably. I had gained seven and a half inches and went from a hundred and thirty-eight pounds to two-hundred and fourteen pounds.” Its no wonder his family did not recognize him. Nate stood a fender watch when the Special Sea Detail was set, like when PC 1128 came alongside another ship. Such was the case when, just days before Iwo Jima landings, he suffered the injury, which ended his naval career and required months of agonizing rehabilitation. With mounting irritation Bob remembers, ”Our skipper had friends on an Australian minesweeper, and Australian ships always had alcohol. So, we came alongside the minesweeper in a terrible wind. I was fenderman, and I was ordered forward to, you know, receive their vessel. Their bow hit our bow and hit the 3-inch 50-caliber gun and wiped it out. I got pinned against our Mousetraps, hitting my left arm and fractured it at the wrist, fractured it at the forearm, and compound fractured it above my elbow.” With no doctor aboard, all the pharmacist mate could do for Nate was inject him with morphine and wait for medical help to arrive. Shipmates erected a tent over Bob, and a well-meaning cook fed him Coca-Cola and cherry pie as he waited four-and-a-half hours for assistance. Relief came in the form of the hospital ship USS Bountiful (AH-9). “I have no idea how they got me aboard; I eventually went to sleep on the deck.” Nate underwent surgery and emerged with an upper-body cast to support his spine and his left arm raised above his shoulder. Bob’s final recuperation destination was the Santa Margarita Naval Hospital at Camp Pendleton in Oceanside, California, by way of an Army hospital on Saipan and Honolulu. While in Hawaii Bob spoke to his father when he answered a ringing random pay phone. A one-in-a-trillion occurrence that is too fantastic to believe, except it happened. Next, a converted ocean liner transported him to Oakland Naval Hospital, Oakland, California and finally by train to Oceanside. Bob’s body cast was so unwieldy that he could not walk aboard the train. A window had to be removed, and he was passed in and out of the train by hand through the opening. The war ended for Bob Nate while he was recuperating at Camp Pendleton when the war ended on August 15, 1945. “When the war was declared over, all of those who were ambulatory, went to Oceanside to celebrate. My situation was a little different; I had no clothes that would fit the cast around my body.” Bob would have to wait seventy-one years to celebrate V-J Day and receive the recognition he so richly deserved. 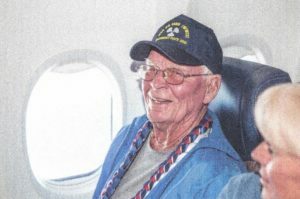 In 2017, Bob accompanied by his daughter Debbie, joined thirty-five World War II veterans, all but two (Bob and another) wheelchair bound, aboard the Honor Flight. On this trip to Washington DC, the vets, and their guardians, visited the World War II Memorial, Vietnam Memorial Wall, Korean War Veterans Memorial, Tomb of the Unknown Soldier and Arlington Cemetery to reflect at their respective memorials.